Photograph of KNM ER 406, a male specimen. তার মাথার খুলি বিশেষায়িতভাবে তৈরী যাতে চাবানোর জন্য দাঁত বেদগ ভারী হত এই বৈশিষ্ট্য আধুনিক কালের গরিলার মধ্যে দেখা যায়। তাদের চর্বণ দাঁত এত বড় হত যে তার আকার আধুনিক মানুষের চেয়ে বড় হত। The species is sometimes referred to as "Nutcracker Man" because it had the biggest, flattest cheek teeth and the thickest enamel of any known hominin. P. boisei had large chewing muscles attached to a pronounced sagittal crest. To accommodate their enormous cheek teeth (four times the size of modern human teeth), প্যাঃ বয়েজী এর প্রশস্ত মুখমণ্ডল ছিল; যদিও তাদের সম্মুখদিকের দাত কাছাকাছি অন্যান্য প্রজাতির তুলনায় ছোট ছিল। ​ Some argue that the craniodental morphology of this taxon (e.g. large postcanine dentition, thick enamel, robust mandibles, sagittal cresting, flaring zygomatic region) is indicative of a diet of hard or tough foods such as ground tubers, nuts and seeds. However, research on the molar microwear of P. boisei  has found a pattern very different from that observed in P. robustus in South Africa, which is thought to have fed on hard foods as a fallback resource. This work suggests that hard foods were an infrequent part of P. boisei's diet. Carbon isotope ratios suggest P. boisei had a diet dominated by C4 vegetation, unlike P. robustus in South Africa. 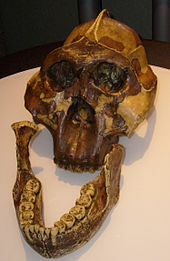 Casts of the skull sometimes known as "Nutcracker Man", found by Mary Leakey in 1959, and the jaw known as the Peninj Mandible, found by Kamoya Kimeu in 1964. সর্বজন স্বীকৃত একটি তত্ত্ব হলো প্যাঃ বয়েজী তাদের পুষ্টির জন্য শক্ত খাবারের উপর নির্ভরশীল ছিল। প্যাঃ বয়েজী এর ক্ষেত্রে বিবর্তনীয় ভাবে শক্তিশালী চোয়ালের পেশী অভিযোজিত হয়েছে যাতে করে তারা বাদাম, মুলের মত শক্তপোক্ত খাবার খেতে পারে। প্যাঃ বয়েজী এর মোলার দাত সংকীর্ণযা দেখে মনে হয়; এই প্রজাতি ছোট শক্ত খাবার খেত। ​ The foods that P. boisei would have ingested can be determined by means of carbon isotope measurements (not to be confused with radiocarbon dating). Along with fruits and nuts, carbon isotope data on P. boisei fossils suggest that their diet was largely based on C4 resources, probably grasses or sedges. One study has concluded that the diet of P. boisei actually consisted mostly of grasses and sedges such as tigernut and that it rarely ate fruits and nuts. According to another, the addition of tubers to its diet helped P. boisei to meet its daily caloric intake requirement. In any case, it would appear that P. boisei consumed larger quantities of plant matter than any other hominin studied to date. ​ The diet of fruits and nuts that P. boisei would have eaten is reflected by its classification as a cosmopolitan species, meaning that its wide geographic range would result in a diverse diet of different foods. The data suggest that this C4 resource centered diet was present over a wide range of period and region, with Paranthropus in eastern Africa and southern Africa having different diets. ↑ Findings Challenge Conventional Ideas on Evolution of Human Diet, Natural Selection Newswise, Retrieved on June 26, 2008.